Turkey has pulled its troops out of a Nato exercise in Norway over an alleged insult to its political leaders. 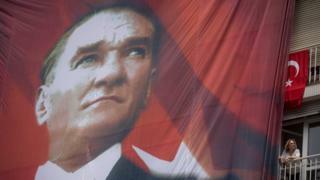 Reports said that an image of the "enemy" in the mock exercise was actually a photo of modern Turkey's founder, Mustafa Kemal Ataturk. Turkish media also reported that a fake social media account in the name of President Recep Tayyip Erdogan was used to send anti-Nato messages. Turkey withdrew all 40 of its participating troops in response. The country has the second largest military force in Nato, and is involved both in coalition efforts against so-called Islamic State and in Nato's Afghanistan mission. Norway's Defence Minister Frank Bakke-Jensen issued a statement of apology for the incident, which he blamed on a single individual. He said the messages had been sent on the private computer network used in the drill, "and in no way" reflected Norway's views. Turkish broadcaster NTV said that one person involved was a Norwegian officer of Turkish descent. But Mr Bakke-Jensen said the Norwegian involved was an external contractor hired for the exercise, and he had been removed from his role. An investigation is under way, he added. Nato Secretary General Jens Stoltenberg also issued an apology, calling Turkey a valued member of the military alliance. Despite Turkey's military and strategic importance, given its borders with Syria, Iraq, and Iran, relations with Western nations have been under stress over the past few years. President Erdogan was openly embroiled in diplomatic spats with Austria, Germany, and the Netherlands earlier this year when they restricted public political rallies of expatriate Turks. Instead, Turkey has pursued a closer relationship with Russia, with which it has also co-operated on air strikes in Syria. Turkey's candidacy for membership of the European Union has also effectively stalled, and the union was critical of President Erdogan's crackdown on academia and the judiciary following an attempted military coup last year. In its wake, a number of Turkish officers posted to Nato requested asylum - and have been unable to return home.